Unit is 64″ wide (load side) x 49″ deep x 135″ high. Heavy-duty carbon steel tubular adjustable height frame provides future flexibility. System is designed with a mild carbon steel bag filler inlet tube. Inlet tube has an outer dust control sleeve to allow for dust take-off. Bag inflation system removes folds and creases in bulk bag for enhanced stability. Unit includes a fully integrated carbon steel gain-in-weight platform scale system with a digital weight indicator. Fully integrated adjustable bag densification system with twin electric vibrators. Densification system includes the MTS exclusive adjustable air mount isolation system. Scale controller provides automatic control of bag inflation, densification, and the inlet valve. 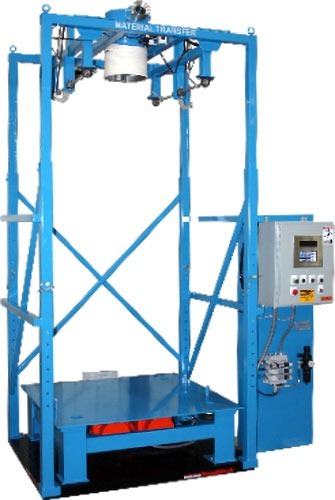 Unit includes our pneumatically actuated bag hanger release system, for releasing the bag loops from the system. Carbon steel, sandblasted, and painted Safety Blue. FDA / USDA approved inflatable spout seal creates a dust tight connection between fill head and inlet of bag spout.